Having the right tools for the job is essential in any field and has become increasingly expensive as industrial production methods require bigger, more sophisticated machinery than before. The making of soft drinks was widespread in the early twentieth century as small, local producers turned out refreshing favourites like Orange Pulpy and Ginger Beer. We have a collection of pop making machinery that includes large vats for preparing the beverages and the equipment for bottling them under pressure without losing that essential fizz. Nova Scotia has a long history of textile production dating back to the days of water powered carding mills in the early nineteenth century. We have some examples of the more complex technology used in twentieth century mills. 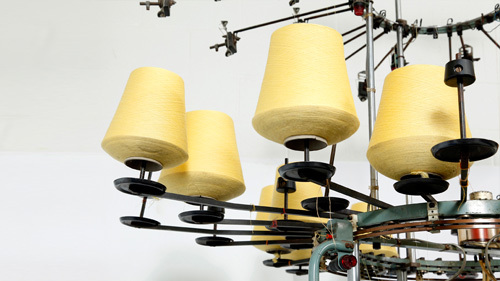 Modern textile factories use large complex knitting machines that create fabric knitted in the round from which garments are cut and sewn. We have two that date from the 1950s and was brought to Stellarton by an Italian knitwear firm, Donato Faini. The Museum collected a lot of 22 artifacts from Dominion Textiles, Yarmouth after it ceased production in the 1980s. The original plant was founded as the Yarmouth Duck & Canvas Co. in 1883 to make sail canvas and it later switched to other industrial fabrics to stay in business. A variety of iron and steel fabrication industries were active in Nova Scotia making everything from nails and axe heads to rail cars. The Museum has collected equipment from a variety of companies and the tools run from foundry tongs and wooden patterns to a hydraulic forging hammer that pounded out rail car axles.